On-and-off rain showers failed to dampen the spirits of thousands of runners who hit the wet roads in Redondo Beach for the 41st edition of the Super Bowl 10K/5K race Sunday morning. Omar Gonzalez, 27, of Los Angeles was the big winner of the day, capturing the 10K race with a time of 32 minutes, 19 seconds. South Bay Runners Club member Cheyne Inman, 33, finished second at 34:07. Inman also is an assistant coach for West High School’s cross country team. Placing third was Redondo Beach’s Alexander Gorney. The 31-year-old Redondo Beach resident finished with a time of 34:18. Inman and Gorney also finished second and third, respectively, at the 2018 Manhattan Beach 10K in October. 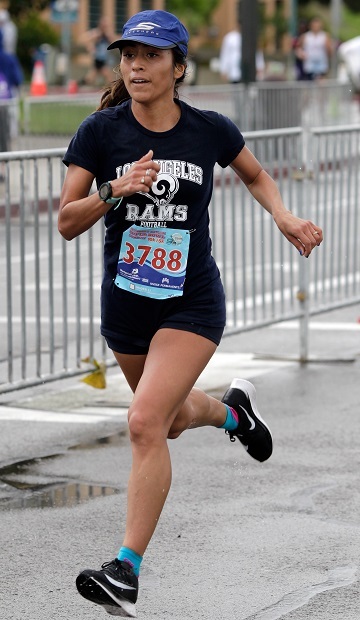 Grace Graham-Zamudio, 25, of Newhall captured the women’s 10K title with a time of 36:45, outpacing Rachel Miura, 28 of Santa Monica (37:07) and Redondo Beach’s Karen Edmonston, 42, (39:01) who finished second in 2018. “I enjoyed the course although it was definitely challenging with the rain, wind and hills,” Miura said. “It was nice to see so many people still come out and run, regardless of the conditions. 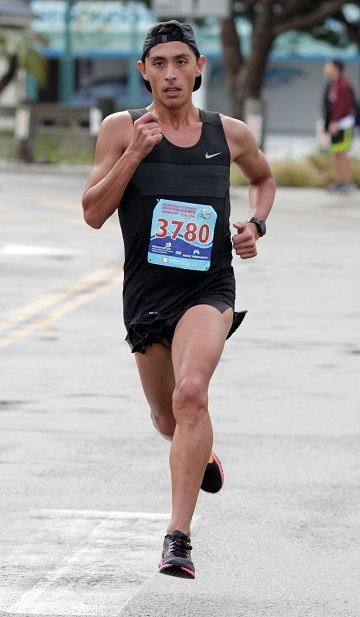 In the 5K, Matthew Klein, 28, of Pasadena claimed victory with a time of 16:26, narrowly defeating Austin Van Biezen, a 25-year-old from El Segundo who posted a time of 16:58. Brian Lindensmith, 37, of Los Angeles placed third (17:40). Regina Lopez, 28, claimed the women’s 5K title with a time of 17:51 holding off a pair of runners from Janes Elite Racing. Ingrid Walters, 47, of Santa Monica placed second with a time of 18:43 while teammate Emily Bernath, 34, finished a close third at 18:45. 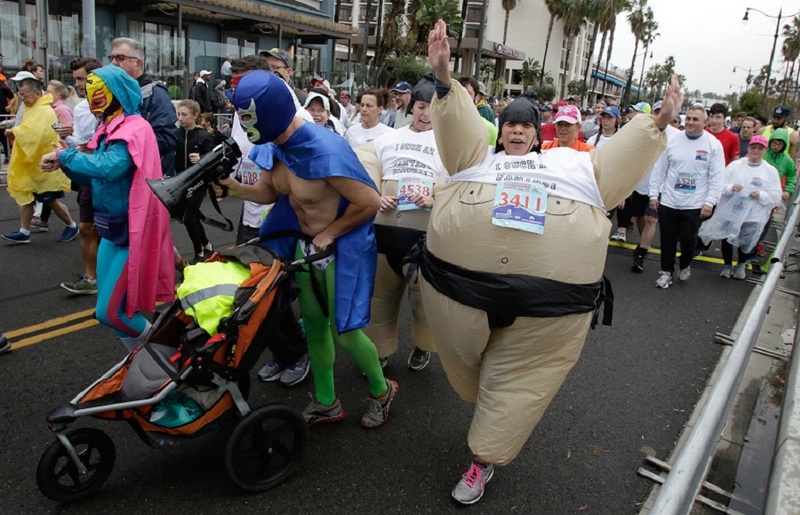 Redondo Beach’s Michael McKellar, 30, took top honors in the Baby Buggy 10K with a time of 42:00. Males capturing 10K age divisions included: Hayden Green (1-14, 40:23), Cormac Carew (15-18, 36:50), Michael Nakahara (19-24, 37:18), Gonzalez (25-29), Inman (30-34), Rob Duffy (35-39 49:40), Aaron Munger (40-44, 36:55), Nobutoshi Tajima (45-49, 42:50), Tom Sherwin (50-54, 41:17), Rich Gust (55-59, 40:41), Roderick Powell (60-64, 44:12), Ed Avol, (65-69, 47:14), Bruce Timmer (70-74, 57:07), Charles Koppany (75-79, 56:14) and Paul Dorr (80-84, 1:43:07). Females placing first in their age divisions were: Josephine Hunt (1-14, 1:00:56), Amanda Crowell (15-18, 45:56), Chloe Masuda (19-24, 44:14), Graham-Zamudio (25-29), Cristina Lowry (30-34, 39:19), Elizabeth Ben-Ishai (35-39, 39:07), Edmonston (40-44), Miriam Marks (45-49, 43:49), Martha Espinoza (50-54, 47:39), Kathleen Phair (55-59, 47:18), Barbara Lyons (60-64 48:46), Barbara Varon (65-69, 1:01:14), Grace Hanover (70-74, 1:09:57) and Mary Elwell (75-79, 1:23:55). Males winning their age divisions in the 5K included: Harry Lonsdale (1-14, 20:28), Fabian Varelas (15-18, 18:30), Alex Hernandez (19-24, 21:20), Klein (25-29), Kevin Dieterle (30-34, 19:19), Lindensmith (35-39), Alonzo Ramirez (40-44, 19:55), Jun Horiuchi (45-49, 20:02), Dennis Piotrowski (50-54, 21:22), Jake Courtney (55-59, 18:45), Charles Kaminski (60-64, 22:16), Kevin Strehlo (65-69, 21:53), Peter Joyce (70-74, 27:05), Matthew Tarnay (75-79, 30:33), John Frederick (80-84, 47:27) and John Zablocki (85-120, 43:21). Female 5K winners included: Ella Freebury (1-14, 21:57), Isabel Ramirez (15-18, 22:01), Abigail Gardner (19-24, 19:23), Lopez (25-29), Bernath (30-34), Gwendolyn Ostrosky (35-39, 20:25), Cambria Wu (40-44, 19:04), Walters (45-49), Tania Fischer (50-54, 20:07), Stephanie Acre (55-59, 24:18), Jenny Kusagaya (60-64, 24:12), Linda Starr (65-69, 32:59), Setsuko Abe (70-74, 31:39), Madeleine Tarnay (75-79, 36:25) and Colleen Golden (80-84, 52:57). Full race results can be found at Redondo10K.com.